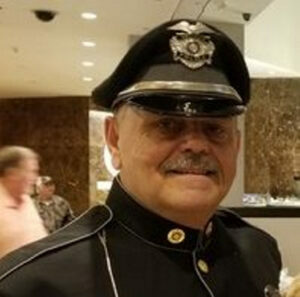 Wayne ‘Pooch’ Drown, the resource officer at Gorham High School since 1998, died Sunday at the age of 64. The field house at the University of Southern Maine was filled by close to 2,500 people Thursday for the funeral of Wayne "Pooch" Drown. 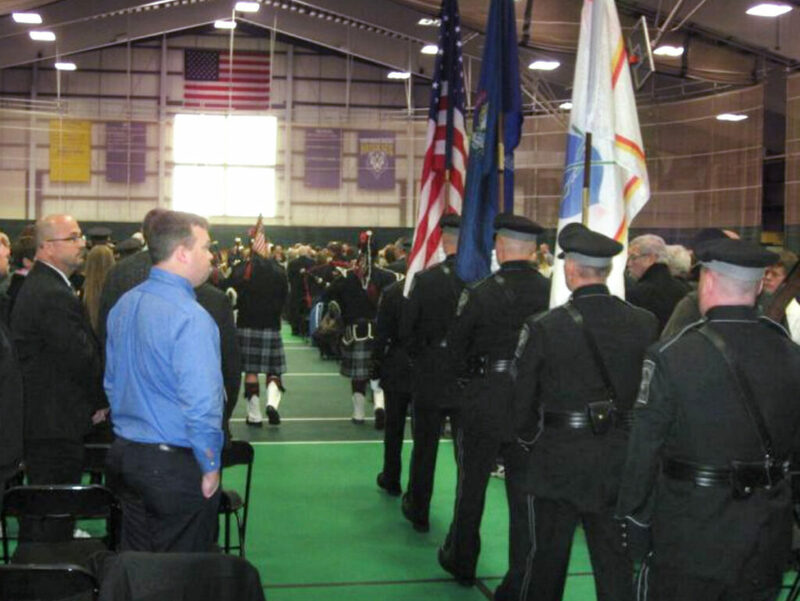 Photo by Albert Bean Jr.
More than 2,500 people, including Gorham students and teachers as well as police officers from around the region, attended the funeral Thursday morning for a longtime Gorham school resource officer who died this week. Gorham native Wayne “Pooch” Drown began his 45-year career as a volunteer firefighter in 1974. Wayne “Pooch” Drown died Sunday evening at Maine Medical Center of a heart attack, according to his obituary. A lifelong resident of Gorham, Drown was 64. The crowd filled the field house at the University of Southern Maine Costello Sport Complex – on the Gorham campus of USM – to near capacity. There were so many people that the town had to deploy shuttle buses to take people to and from satellite parking lots. Gorham schools were closed for the day so students and families could attend the service. A police honor guard began the ceremony. “At 64 years of age, on the edge of retirement, why did he have to be taken from us? It makes no sense. It is certainly unfair. It’s not right. So it’s with these mixed emotions we gather. We say thank you Lord for the gift that has been Pooch,” Rev. Tim Higgins said during the service. Drown grew up in Gorham, graduating from Gorham High School. He devoted much of his life to helping make Gorham a better place to live. He was one of the founders of Special Olympics in Maine, he helped start the DARE program in Gorham schools and supported local athletic programs. He coached youth basketball, worked as a basketball official, and coached Gorham’s junior varsity softball and golf teams. Drown won the respect of both students and law enforcement during a 45-year career. He began his career working as a volunteer for the Gorham Fire Department in 1974. In August 1982, Drown was hired as a reserve police officer for the Gorham Police Department. He became a full-time officer in 1984. Drown was promoted to police detective in 1986, a position he held until being named the town’s first school resource officer in 1992. In 1998, he became the school resource officer at Gorham High School, a position he held until his death. Drown is survived by his wife and two adult daughters. American Journal Staff Writer Robert Lowell contributed to this story.